Do men use bad language more than women? How do social class and the use of bad language interact? Do young speakers use bad language more frequently than older speakers? 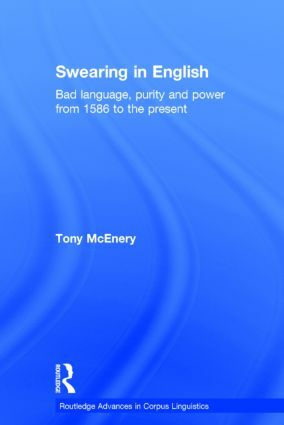 Using the spoken section of the British National Corpus, Swearing in English explores questions such as these and considers at length the historical origins of modern attitudes to bad language. Drawing on a variety of methodologies including historical research and corpus linguistics, and a range of data such as corpora, dramatic texts, early modern newsbooks and television, Tony McEnery takes a socio-historical approach to discourses about bad language in English. Arguing that purity of speech and power have come to be connected via a series of moral panics about bad language, the book contends that these moral panics, over time, have generated the differences observable in bad language usage in present day English. A fascinating, comprehensive insight into an increasingly popular area, this book provides an explanation, and not simply a description, of how modern attitudes to bad language have come about. Corpus based linguistics is a dynamic area of linguistic research. The series aims to reflect the diversity of approaches to the subject, and thus to provides a forum for debate and detailed discussion of the various ways of building, exploiting and theorizing about the use of corpora in language studies.